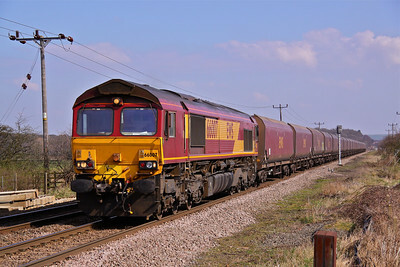 66001 looks smart in its DB Schenker paint job as it eases 6J94 12:50 Goole Docks - Masborough FD steel hoods past Old Denaby, Mexborough on 26/03/15. 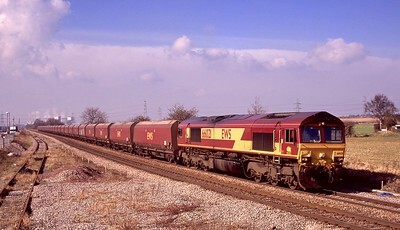 66001 speeds North past Eaton Lane with 4E25 11:25 Bow - Heck Plasmor empties. 19/08/09. 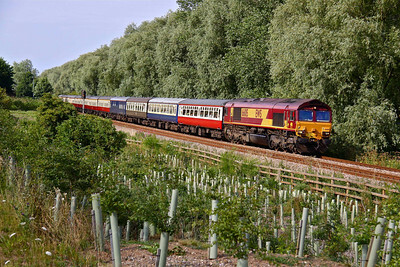 66001 with colour co-ordinated wagons, passes Slitting Mill UWC, with a late running (56 Minutes) 6X01 10:17 Scunthorpe Trent Yard - Eastleigh CWR train on 28/08/14. 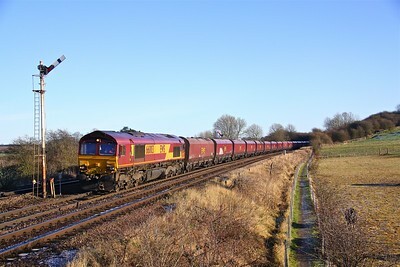 66003 approaches Barnetby East with the 11:33 Immingham Bulk Terminal - Scunthorpe loaded coal train on 29/12/14. 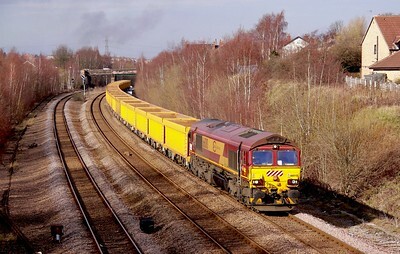 66003 passes Slitting Mill UWC with an empty MGR coal train. 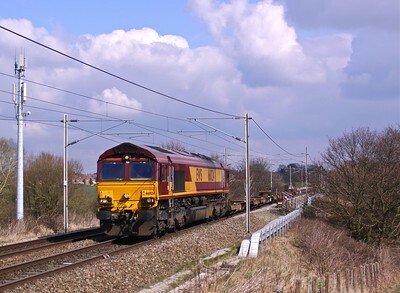 66004 makes a fine sight as it coasts down grade working an additional 6J58 12:30 Stocksbridge - Aldwarke, passing Neepsend on the former electrified Woodhead route on Easter Monday - 25/04/11. 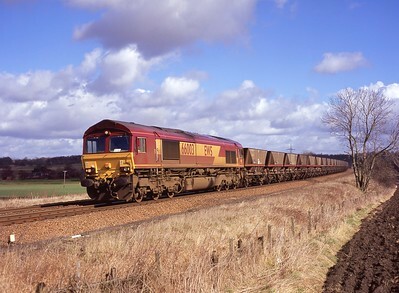 The first Five wagons contain scrap castings. 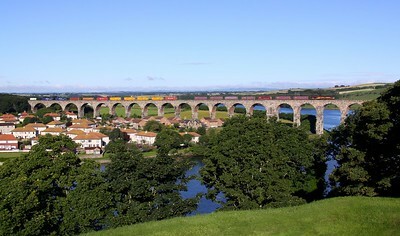 66005 crosses the Royal Border Bridge, Berwick-Upon-Tweed with a colourful and well loaded 4S99 04:22 Tees Dock - Mossend Euroterminal on 27/07/16. 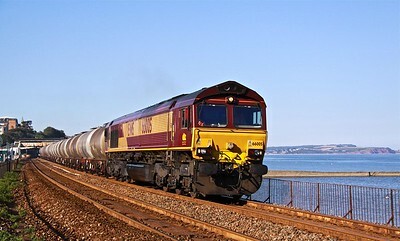 66005 runs along the sea front at Dawlish with 6C62 15:31 Bristol St Phillips Marsh - Tavistock Junction fuel tanks on 24/07/12. 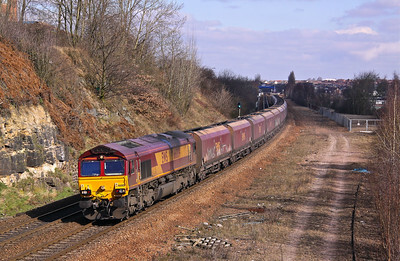 66007 labours past Didcot East with 4O40 08:21 Oxford BMW - Southampton on 14/03/13. 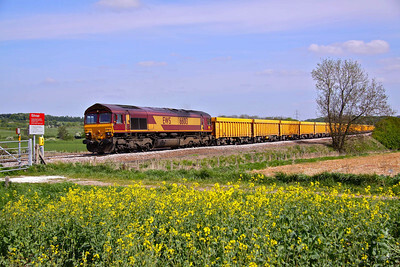 66007 passes Rushey Sidings Crossing, West of Retford with 4R17 Cottam - Immingham coal empties, 23/03/11. 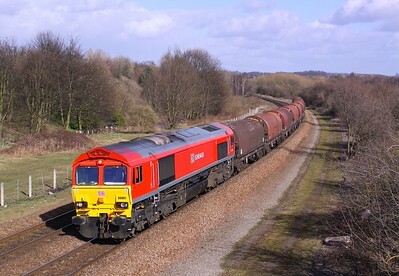 66009 passes Kilnhurst with a loaded Coal train for Ratcliffe Power Station on 06/04/13. 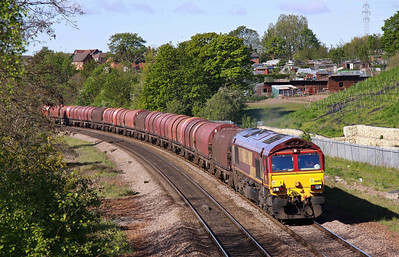 66012 and 66156 top and tail past Ecclesfield with 3S14 11:13 Grimsby - Malton RHTT. 20/11/09. 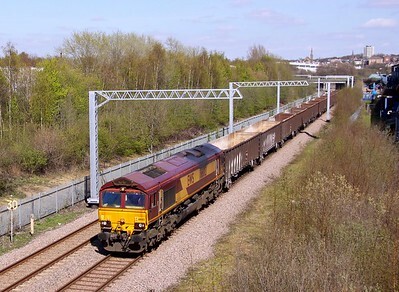 66012 lifts 6E20 Margam - Immingham empty steel hoods away from Masbrough North Junction as it approaches Primrose Bridge, Rotherham, 12/05/12. 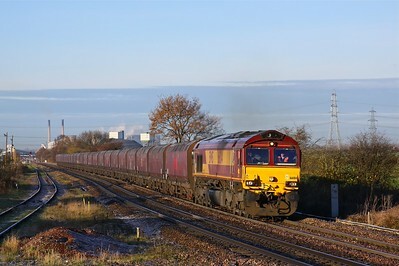 66012 passes Slitting Mill UWC, just North of Barrow Hill with 6M73 10:52 Doncaster - Toton, 09/12/10. 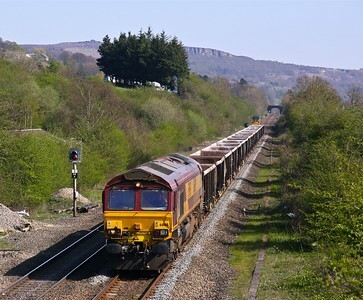 66013 looking rather work stained, hurries past Woodhouse Mill, on its elongated route home working 6Z69 13:50 Heck - Dowlow Briggs Sidings empty MMA’s on 09/03/17. The train is running via Toton instead of the more direct route via Sheffield because of on going Tram train engineering work. 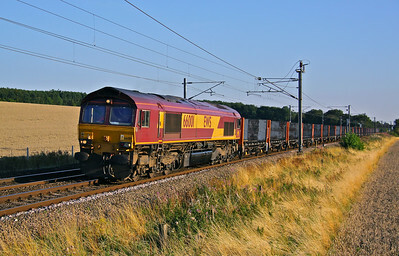 66013 passes Slitting Mill UWC with 6M23 Doncaster - Mountsorrel empty ballast boxes. 04/05/11. 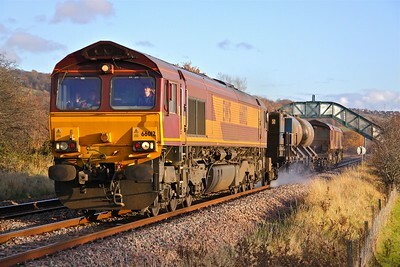 66014 approaches Whitley Bridge Station with 6H43 06:27 Immingham Pad 1 - Drax loaded coal on 06/12/14. 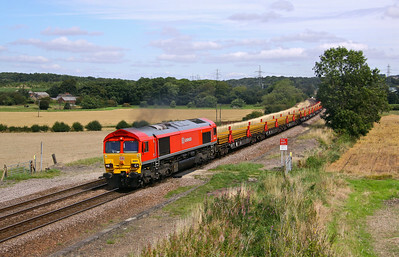 66015 passes Scarborough Mere with the returning 1Z34 16:52 Scarborough - Kings Cross, 24/07/10. 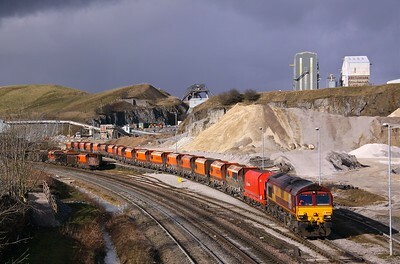 66018 propels JGA’s into Dove Holes Quarry for loading. 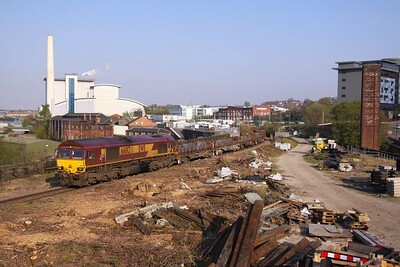 The train had arrived at Peak Forest ex-Washwood Heath some 70 earlier. Taken on 21/02/15. 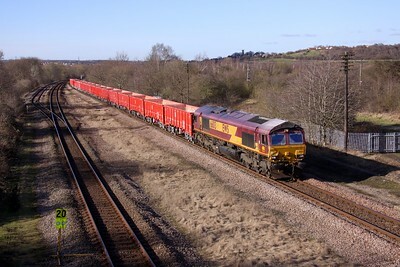 66021 passes Whitley Bridge with 6C05 08:45 Immingham - Eggbrough loaded coal on 05/03/09. 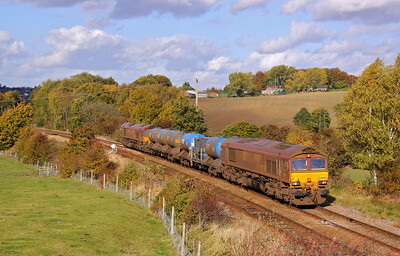 66023 and 66125 pass Crigglestone on 3S14 11:13 Grimsby - Malton RHTT. 27/10/10. 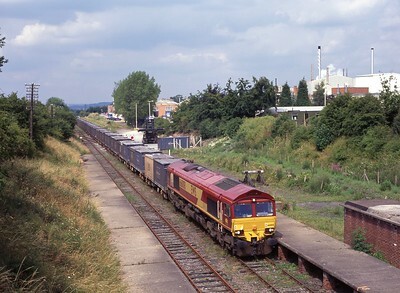 66023 restarts from a recess at Stourton with a loaded coal train for Clitheroe on 27/07/99. 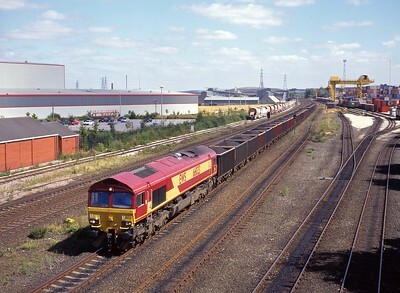 66024 hauls the 12:04 Wigan L.I.P. 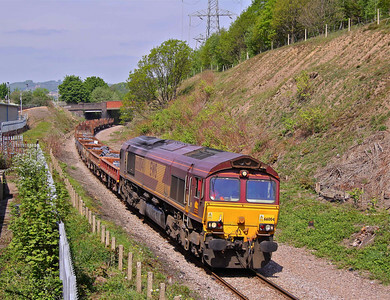 - Arpley past Red Bank on 25/03/15.